1. Head to Settings --> Integrations --> Customer facing Display. 2. 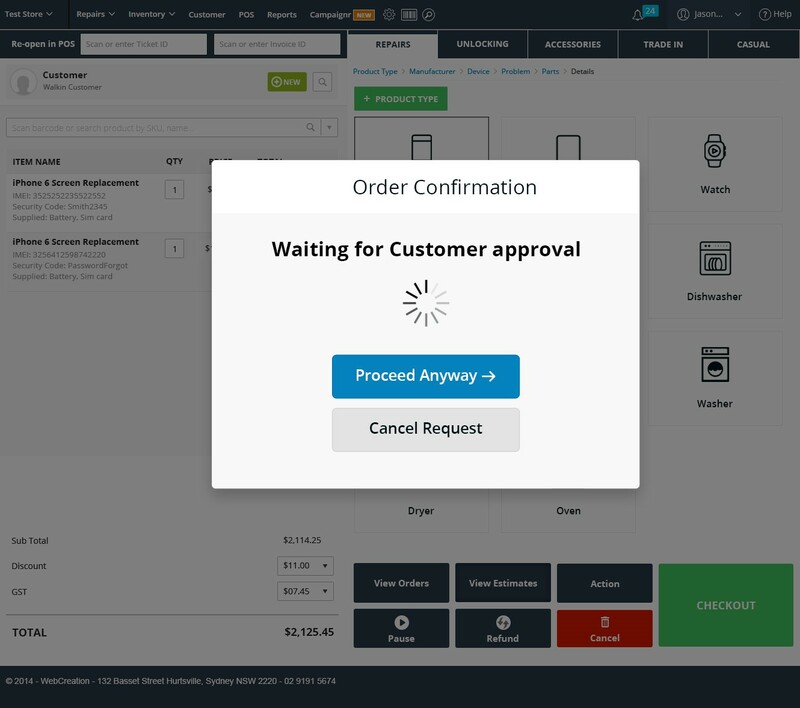 Enable Customer Facing Display by hitting Enable button at the top right corner of the screen. 3. Once enabled, head to Configuration tab to configure customer facing display settings. 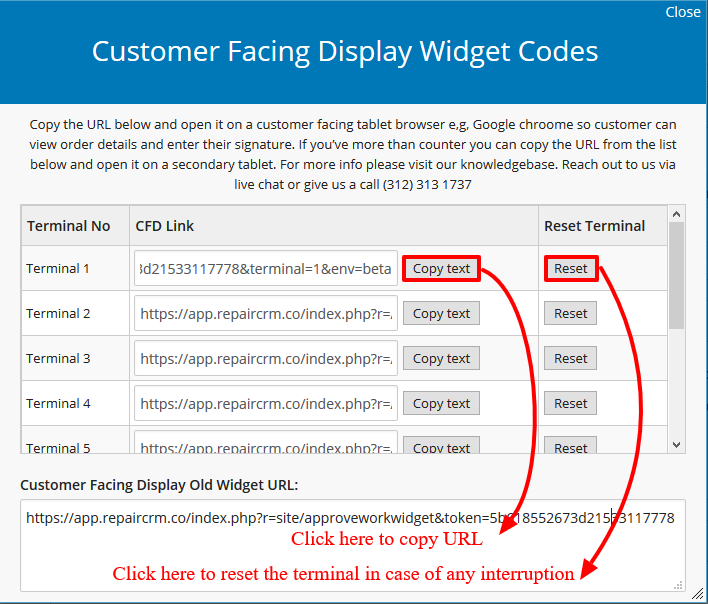 Please follow the steps below to configure customer facing display. Copy current machine terminal ID and open given URL on customer facing tablet. Select the same terminal against which you have opened the provided URL. Note: Please note that terminals are browser specific and once a terminal is selected at one store, it will automatically be selected on switching to another store in same browser. However if you have changed the browser, then you will have to re-selelct the terminal. b) Select modules against which you want to show customer facing display. Note: Please note that by default customer facing display will be disabled against all criteria mentioned above. You need to enable customer facing display manually by check marking the box against which you want customer facing display to work. c) Next step is to upload the image that you want to display on front facing slide. By clicking on Choose file, you can choose and upload the image within the size limit of 2MB and in any format including jpg, png and gif images. d) To get a custom banner designed for your front facing screen, hit Learn More button and it will redirect you to following page where you can fill out the requirements and place order to get banner designed. e) Enter terms and conditions for pre-device repair, post-device repair, refund and trade-in purchase. Hit Save to store configuration settings and you are ready to use Customer Facing Display. 4. On Customer end, you will see the following front facing slide that you have uploaded. Now when a repair ticket is created from POS following the procedure as described here, all information will be shown on customer facing display on runtime so that if any change is made in cart on POS, that change will be reflected on Customer Facing Display so that customer can review before entering his signatures. Note: By hitting proceed anyway, the transaction will be completed without taking customer signatures. 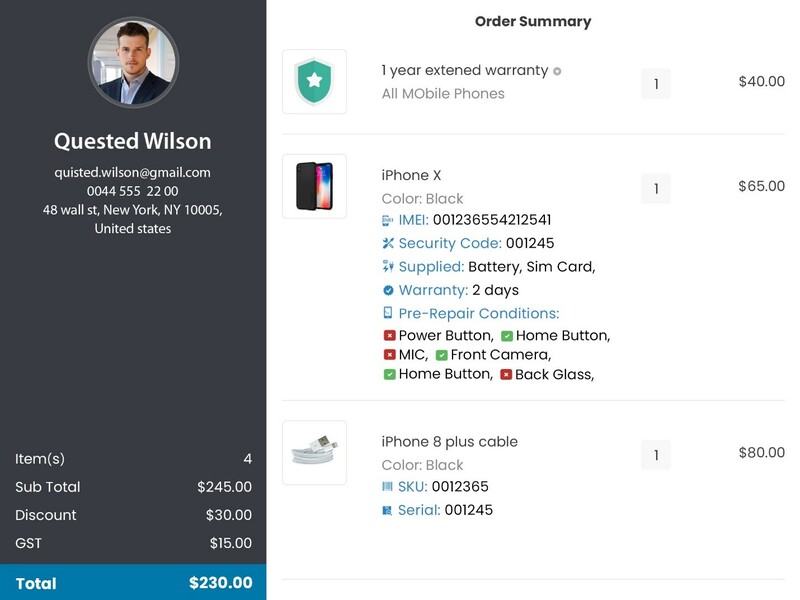 By hitting cancel request, request to take customer signatures will be cancelled and user will be redirected to cart where he can edit order details. 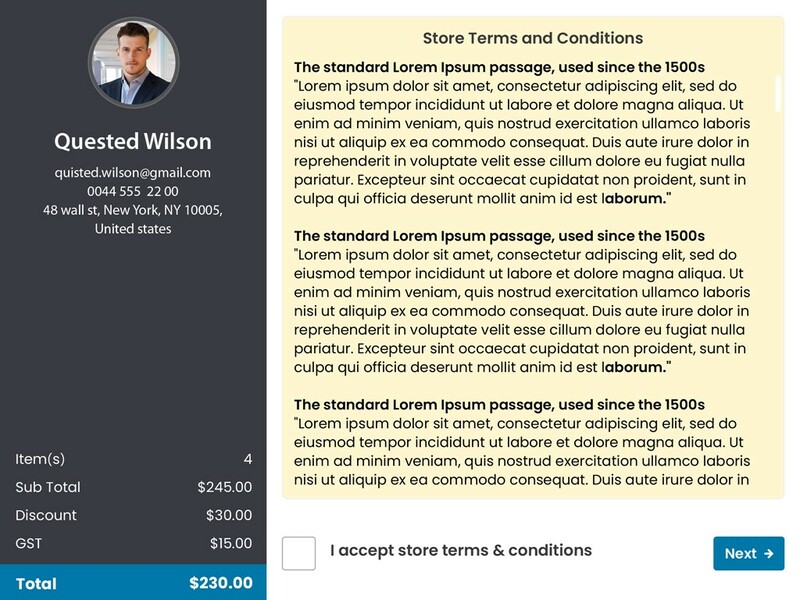 While on customer end, following screen will be displayed where he can review and accept terms and conditions. Note: It is important to accept terms and conditions to move forward. By hitting Next, user will be directed to following screen where he needs to enter his signatures. 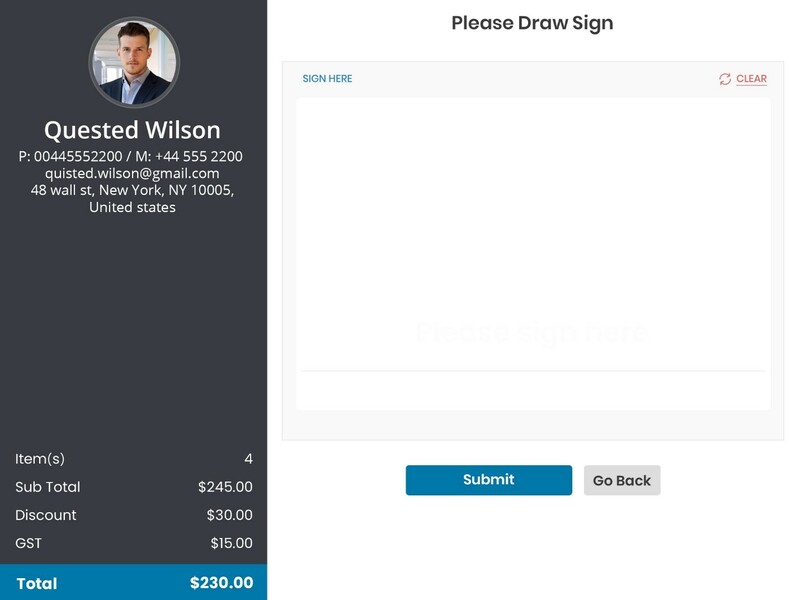 By entering signatures and hitting submit, user will be directed to following Thank you screen. 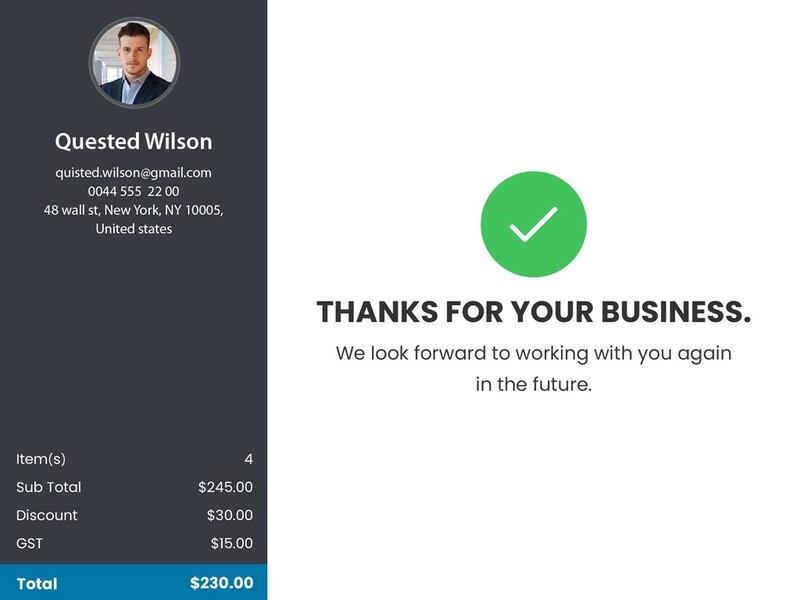 Similarly you can take customer signatures while offering refund, purchasing trade-in item and making invoice. Please note that while making an invoice against a repair ticket, you will see the toggle to display pre-repair or post-repair device conditions for taking customer signatures. 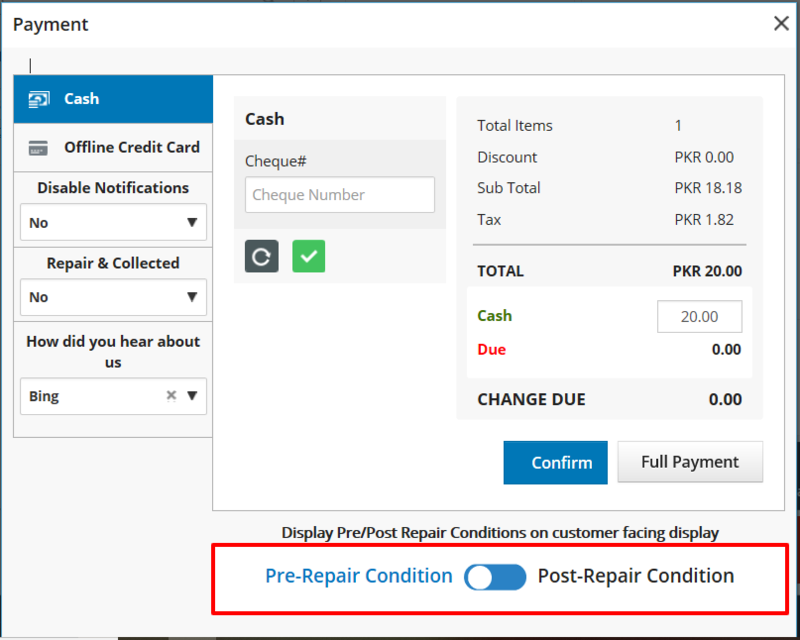 If the toggle is towards pre-repair conditions than customer will see pre-repair terms and conditions on customer facing display. Alternatively, if the toggle is towards post-repair conditions than customer will be able to view post repair terms and conditions before entering his signatures. Similarly while offering refund, following the procedure described here, user will get the following pop-up on hitting complete payment button. While making trade-in purchase as described here, following pop-up will be shown for taking customer signatures and remaining process will remain same as described above. Q. Can we use customer facing display on iPad POS Register app? A. Yes definitely you can use customer facing display on iPad POS Register app. 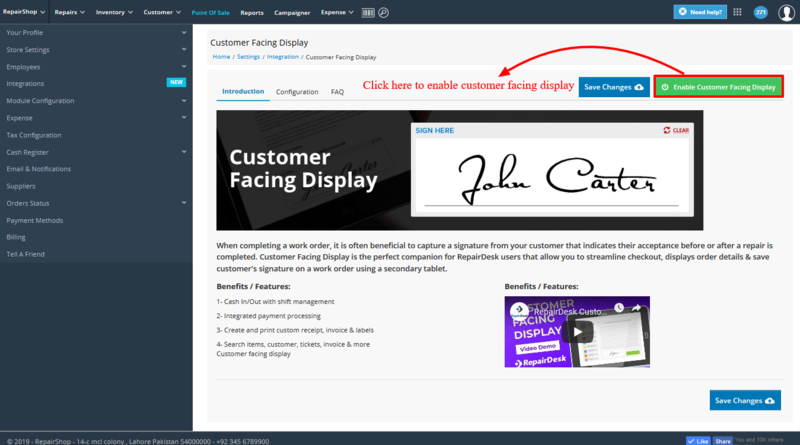 Please follow the link here to know how to use customer facing display on iPad app. Q. How can I take and download pre/post repair signatures from Manage Tickets sections? A. To take pre/post repair signatures from manage tickets, head to manage tickets --> action button --> edit ticket. There you will get an option to take signature. The request will be sent to customer facing display from where user can get signatures. Once signatures are taken and ticket is saved, you will get the option to download pre-repair signatures. By hitting download, signatures will be downloaded and stored in your system. In the same way you can take and download post repair signatures.